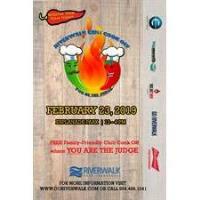 It’s all about chili and charity on Saturday, February 23rd at the annual Riverwalk Chili Cook-Off at Esplanade Park! 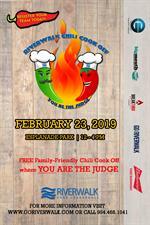 The goal of this annual event is to bring together professional, amateur and teams of aspiring and non-aspiring cooks together with local charities for a friendly chili cook-off competition where “YOU BE THE JUDGE.” The event is FREE to attend for Chili lovers of all ages, Riverwalk supporters and well-behaved dogs on leash. For $5, attendees will be able to sample multiple chilies and vote on who they think makes the best chili. The afternoon will be complete with live entertainment from the Schools of Rock West Broward, Pompano Beach and Coral Springs, vendors, and fun activities for all to enjoy; while raising funds for Riverwalk Fort Lauderdale and multiple local charities. The theme of this year’s event is SPORTS TEAMS, so feel free to rock your own favorite sports team apparel gear.